When your friends or family get married, there are all kinds of rules that govern their behavior. But did you know there are rules for wedding guests too? Reviewing these wedding etiquette do's and don't's will ensure you don't inadvertently commit a faux pas at your loved one's affair. DO RSVP promptly. The couple will be making several decisions based on the number of people able to attend the wedding. The headcount affects how many seats are needed, how many favors must be purchased, how many meals the caterer should prepare, etc. If you must cancel your RSVP after you have accepted an invitation, do so as soon as possible. The couple may have some time before they need to provide final numbers to the caterer. If something comes up last minute, however, don't call the guests of honor; they'll be too busy with last-minute preparations and details. Send a thoughtful email apologizing for your absence instead. DON'T bring a gift to the wedding, though cards with checks or cash are appropriate to bring. Instead, choose to have the wedding gift shipped to the couple's home before or after the wedding day. In fact, you have up until a year after the wedding to give a gift. Bringing a gift with you means someone in the wedding party will have to worry about how to get it home. ​DO send a gift even if you do not attend. While wedding gifts are not required, it is customary to send a gift to the happy couple, even if you do not attend the wedding. At the very least, a thoughtful card expressing your good wishes is a must. DO dress appropriately. The dress code may be listed on the wedding invitation. If not, you may pick up cues from the time of day and the formality of the invitation and venue to determine what attire is appropriate. If you are still stumped, or you are uncertain what "Island Casual" means, reach out to a member of the bridal party or visit the couple's wedding website for clarification. DON'T be late. The time listed on the wedding invitation is the time the ceremony will begin, not the time guests are expected to arrive. If a wedding invitation says that the ceremony will begin at 5, be sure to arrive there by 4:45 so as to give yourself time to find a seat, chat with other guests, and get settled. Latecomers run the risk of interrupting the processional or the service. Some churches and synagogues may even prevent guests from entering the venue once the ceremony has started. DON'T take photographs during the ceremony. Not only is it distracting to other guests, but you may also inadvertently get in the way of the wedding photographer. Leave picture-taking to the professionals and respect the sanctity of the ritual in front of you. DO pay attention and read the wedding program if one is provided. Many ceremonies have parts where the congregation alternately stands and sits. The program or officiant may tell you when to do so; if not, follow the lead of others around you. If you are physically unable to stand, remain quietly seated. DON'T bring a date unless your invitation specifically says that person's name or "+ Guest." Remember that the cost for each person attending a wedding is generally high, so bringing unexpected guests is very impolite. This includes your children or other relatives! DO mingle with other guests. 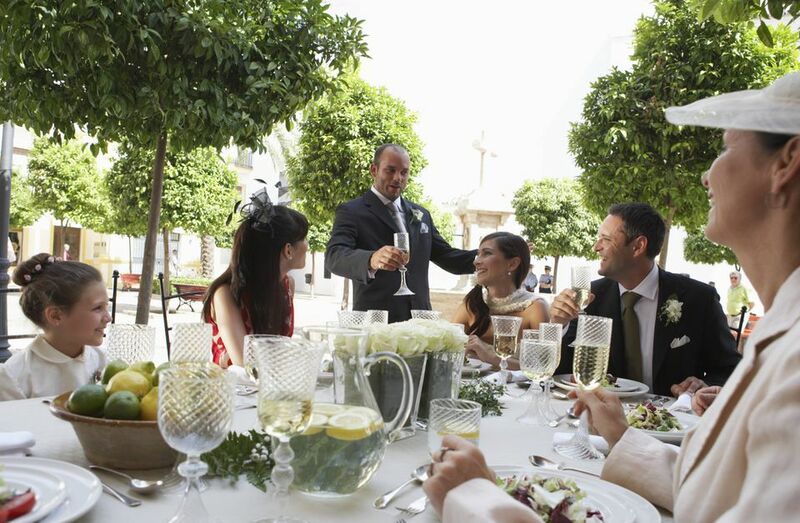 While you may be assigned to a specific table for dinner, you are welcomed to walk around the reception and chat with other guests during the evening. ​DON'T get drunk. While a wedding is a time to enjoy yourself, no one appreciates a drunk guest embarrassing themselves. Drink alcohol in moderation. DON'T give a toast or speech unless you've been invited to do so. DO enjoy yourself, and tell the happy couple you are excited for them.